Citation: Takamori M (2017) Pathogenic Participation of MuSK-Biglycan Linkage Contributive to Synaptic Stability and Signalings in Myasthenia Gravis. J Autoimmune Disord Vol 3:41. Copyright: © 2017 Takamori M. This is an open-access article distributed under the terms of the Creative Commons Attribution License, which permits unrestricted use, distribution, and reproduction in any medium, provided the original author and source are credited. Biglycan, a member of small leucine-rich repeat proteoglycan family, expresses on the skeletal muscle surface and provides a critical link between the basal lamina and the cytoskeleton. As one of the extracellular matrix protains, the glycosaminoglycan-binding form of biglycan is concerned with a linkage to the actin cytoskeleton and thereby contributes to synaptic stability. In addition, as confirmed by the mutation experiment, the non-glycanated form of biglycan links to the muscle-specific tyrosine kinase (MuSK) extracellular domains (immunoglobulin-like domain 1 (Ig1 domain, mediating agrin-signaling) and cysteine-rich domain (CRD, mediating Wnt-signaling)) which constitute the postsynaptic receptive complex in cooperation with low-density lipoprotein receptor-related protein 4 (Lrp4), so that this form takes part in the rapsyn-anchored acetylcholine receptor clustering and possibly in the trans-synaptic communication mediated by Lrp4 and MuSK CRD. In the manner similar to the collagen Q-acetylcholinestease (AChE) complex, the linkage of biglycan with AChE contributes to the localized sensitivity to acetylcholine at the postsynaptic membrane. Since biglycan is an important constituent of the extracellular matrix positioned as the the MuSK-binding protein responsible for synaptic function, it is worth investigating to determine whether biglycan could be directly targeted by a humoral immune response. The antibody assay of biglycan was done in the serum samples from myasthenia gravis (MG) patients positive for antibodies against MuSK Ig1/2 domains and CRD, but we obtained negative results. However, taking the linkage of biglycan with MuSK into consideration, the MuSK antibodies in MG may cause an impairment in the synaptic stability based on the MuSK-linked biglycan, in addition to a misalignment in the pre- and post-synaptic functional organizations. We also briefly discuss about biglycan as a molecule regulating the multifunctional proinflammatory signaling and also participating in the MG thymus pathology (hyperplastic change) on one hand, and a molecule to counter the pathologies in skeletal muscle and bone formation on the other hand. The present review points out both signaling and structural roles of biglycan which has relations with MuSK function. Function of the neuromuscular junction requires a complex architecture formed by a diversity of elements through signals orchestrated by sophisticated interactions. The muscle-specific tyrosine kinase (MuSK) is uniquely positioned as a key protein in this network particularly in relation to acetylcholine receptor (AChR) clustering and pre- and post-synaptic differentiations. The fine synaptic organizations centered on MuSK and related proteins are stabilized by extracellular matrix proteins for efficient synaptic transmission The present review focusses biglycan which is a proteoglycan acting not only as a matrix protein but also as a signaling protein by its linkage to MuSK. The discussion makes reference to the myasthenia gravis (MG) positive for antibodies against MuSK paying attention to the synaptic transmission and also to the linking of MuSK with extracellular matrix. Additonally discussed is that biglycan acts as a proinflammatory stimulus when it is in a soluble form, and also plays a role in hyperplastic change of MG thymus in which biglycan is produced from myoid cells, whereas biglycan has a beneficial effect on dystrophic muscles and bone formation. MG, an autoimmune neuromuscular junction (NMJ) disorder characterized by fatigable weakness of voluntary muscles including ocular, facial, oropharyngeal, limb and respiratory muscles, is a disease of the postsynaptic NMJ where AChRs are recognized by autoantibodies (complement-activating IgG 1 and IgG 3) in ~85% of the MG patients . In an effort to clarify the remaining and/or concomitant pathogens in MG, the search for other pathogenic antigens has detected the antibodies against MuSK (IgG4, independent of complement-activation) and Lrp4 (IgG 1) [2-17], both causing pre- and pos-tsynaptic impairments as confirmed in the animal models by active immunization [6-9,14]. Agrin has also been suggested as a fourth pathogen in MG [18,19]. Acetylcholine (ACh)-mediated neuromuscular transmission requires the highly coordinated structures constructed by the assembly of presynaptic ACh-release machineries where the active zone, synaptic vesicle proteins and Ca2+ channels are included [20-23], and the postsynaptic receptive complexes including rapsyn-anchored AChR clusters, MuSK and acetylcholinesterase (AChE) . The postsynaptic structure is organized by nerve-secreted or muscle-bound proteins such as agrin (heparan sulfate glycoprotein) and Wnts (belonging to Wingless-type integration site family of glycoproteins); the agrin- and Wnt-signalings are mediated via interaction with MuSK where low-density lipoprotein receptor-related protein 4 (Lrp4) acts as a recetor/coreceptor (Figure 1) . The agrin-signaling acts through MuSK immunoglobulin-like domains 1 and 2 (Ig1/2) to form full-sized AChR clusters in the innervated stage of muscle membrane (Figure 1) [25-30]. In the non-innervated stage of muscle membrane, the Wnt-signaling acts through MuSK cysteine-rich domain (CRD) and Dishevelled scaffolding protein (Dvl) to contribute to the prepatterning of AChR cluster formation at the central part of muscle membrane where incoming axons are guided (Figure 1) [31-34]. Reportedly, the MuSK CRD is sufficient to interact with Wnts as shown by that the deletion of the CRD significantly attenuated the Wnt-binding activity of MuSK; however, this CRD deletion did not completely abolish the Wnt-binding to mouse MuSK, suggesting that there may be a possible involvement of other domains of MuSK in binding to Wnts . Figure 1: Schematic presentation of the mechanisms contributive to synaptic stability by extracellular matrix protains and the acetylcholine receptor (AChR) cluster formation by the signalings via muscle-specific tyrosine kinase (MuSK). The stability of rapsyn-anchored AChR clusters, MuSK and acetylcholinesterase (AChE) at the postsynaptic membrane is modulated by the extracellular matrix proteins (including biglycan, collagen Q, perlecan and α-dystroglycan) and by the laminin-network including laminins (α4, α5 and β2) which interacts with muscle agrin. The interaction of the extracellular matrix with transmembrane β- dystroglycan leads to the binding to rapsyn for anchoring AChR clusters at the endplate membrane and also the binding to dytrophyin/utrophin-associated protein complex linked to actin cytoskeleton for synaptic stability. Regarding biglycan, its glycosaminoglycan-binding form contributes to the synaptic stabilization via the interaction with dystroglycans; its non-glycanated form directly interacts with immunoglobulin-like domain 1 (Ig1) and cysteine-rich domain (CRD) of MuSK. The binding of collagen Q and biglycan with MuSK extracellular domains may lead to their implication in reinforcing a functional bridge between the agrin/Lrp4-signaling and the Wnt/Lrp4/Disahevelled (Dvl)-signaling. The cytoskeletal dynamics to stabilize the postsynaptic organization is also brought about by the Dok7-signaling mediator, CrkL-Sorbs1/2 (downstream effects of Crk/CrkL (adaptor proteins which act as CT10 regulators of kinase participating in AChR cluster formation; Dok7 itself acts as an inside-out ligand for MuSK)), and the α-dystrobrevin (mediator of the neuregulin 1 (NRG1)-ErbB (receptor tyrosine kinase of EGF family) interacting signal). Cortactin acts as a regulator of actin polymerization via actin-related proteins 2/3 complex (Arp2/3 complex) . Coronin 6 contributes to firm AChR clustering via the modulation of actin dynamics . In the right lower part, the two signalings are depicted: agrin/Lrp4-MuSK Ig1/2 domains and the Wnt/Lrp4-MuSK CRD-Dvl to form AChR clusters. ; the crosstalk between agrin- and Wnt-signalings (both including Lrp4) thereby contributes to the development of vertebrate NMJ. In the manner similar to Lrp4 and laminin β2, the Wnt-MuSK CRD-Dvl signaling acts as the retrograde signal (Wnt canonical pathway via β-catenin and also non-canonical pathway) which contributes to the active zone organization for conditioning the ACh-release probability in the nerve terminal. The Wnt/Lrp4/MuSK CRD signaling participates in the process of synaptic homeostasis as the retrograde signal from muscle to nerve by way of Dvl, muscle β-catenin (via inhibition of glycogen synthese kinase 3β) and slit2, and also via Vangl2-dependent non-canonical pathway [35-39] (Figure 1). The muscle-derived Lrp4 interacts with an Lrp4-binding protein in motor neurons and thereby acts as the retrograde signal to promote presynaptic differentiation [40,41] (Figure 1). These signals enable the nerve terminal (active zone, synaptic vesicle pool and Ca2+ homeostasis) to, at least in part, compensate postsynaptic dysfunction. The MuSK- and Lrp4-mediated retrograde signalings could be impaired by the antibodies against MuSK and Lrp4 as suggested by the fact that the compensatory ACh release upregulation does not occur in MuSK antibody-positive MG animal model [6-9] and Lrp4 antibody-positive MG animal model . To contribute to efficient synaptic transmission at the NMJ, the postsynaptic structures are stabilized to be precisely opposed to the nerve terminal by actin dynamics [42-45]. The constituents contributive to postsynaptic stabilization include extracellular matrix proteins (such as collagen Q (linked with perlecan)  and biglycan [47,48]), ErbB receptor linked with neuregulin 1 (via α-dystrobrevin 1) , Dok7 downsteam effectors (CrkL-Sorbs1/2) [50,51], and laminin-network (including laminins α4, α5 and β2 and muscle agrin (differently from neural agrin, muscle agrin lacks 4 amino acid insertion at the A/y splicing site and 8, 11 or 19 amino acid insertion at the B/z splicing site in the laminin-like G3 domain of C-terminal segment)) [42-45,52,53] (Figure 1). Regarding Dok7, besides the above-mentioned contribution to synaptic stability, this cytoplasmic adaptor protein plays a crucial role in MuSK activation as an inside-out ligand for MuSK and in early AChR cluster formation via downstream effectors (Crk/CrkL: CT10 regulators of kinase) [50,51,54] (Figure 1).Ã£ÂÂRegarding laminin β2, its contribution to synaptic stabilization directs not only to the postsynaptic structure, but also to the nerve terminal via tethering presynaptic voltage-gated Ca2+-channels to active zone and cytoskeletal elements [52,53] (Figure 1). Regardnig collagen Q and biglycan, they act as extracellular matrix to stabilize the postsynaptic organization including AChR clusters, MuSK and AChE in the synaptic basal lamina of the NMJ, and also to link with MuSK ectodomain (agrin signal-mediating Ig 1 domain and Wnt signal-mediating CRD) [38,39,47,55] (Figure 1). In MG, it is assumed that the MuSK antibodies may cause the impaired synaptic function by the disturbed MuSK-linking to collagen Q. In fact, the in vitro binding assay showed that MuSK antibodies blocked the collagen Q-MuSK linkage . However, it is only in a small number of MG patients that collagen Q was directly targeted by antibodies [57,58]. This result calls our attention to the possibility that the MG patients’ sera would harbor the antibodies which directly recognize an another matrix protein, biglycan. Biglycan, which is one of the proteoglycans and is enriched in the postsynaptic membrane, is a ubiquitous structural component of the extracellular matrix, and acts as a signaling molecule [47,48]. At the junctional region, the glycosaminoglycan-binding form of biglycan mediates its binding to extracellular α-dystroglycan; the β-type of dystroglycan is the transmembrane protein binding to rapsyn for firmly anchoring AChR clusters at the postsynaptic membrane and also binding to the dystrophin/utrophin-associated protein complex linked to cytoskeleton for synaptic stability. The non-glycanated form of biglycan (lacking glycosaminoglycan side chains) directly interacts with the MuSK extracellular domains of MuSK (agrin/Lrp4-mediating Ig 1 domain [25-30] and Wnt/Lrp4-mediating CRD [31-34]) (Figure 1). The biglycan-mediated signals participate in the localized stabilization of AChR clusters, MuSK and AChE at the synapse . The evidence that the two sites of MuSK ectodomain bind biglycan suggests a possible participation of this matrix protein in reinforcing a functional bridge between the agrin-signaling (via Ig1 domain) and Wnt-signaling (via CRD) . The synaptic homeostasis depends on a wide variety of retrograde signals (from muscle to nerve)  in which the muscle Lrp4-originated signal [40,41] and the Wnt (such as Wnts 4 and 11)-MuSK CRD signal [37-39] are included (Figure 1). MuSK antibodies have been shown to have heterogeneity in their binding to MuSK functional domains such as Ig1/2 domains (mediating the agrin-signaling) and CRD (mediating the Wnt-signaling) in MG [60,61] (Figure 2). Since biglycan becomes incapable of linking to MuSK by mutations of Ig1 domain and CRD , the interaction between MuSK and biglycan is potentially blocked by MuSK antibodies in the manner similar to the block of the MuSK-collagen Q linkage by MuSK antibodies . 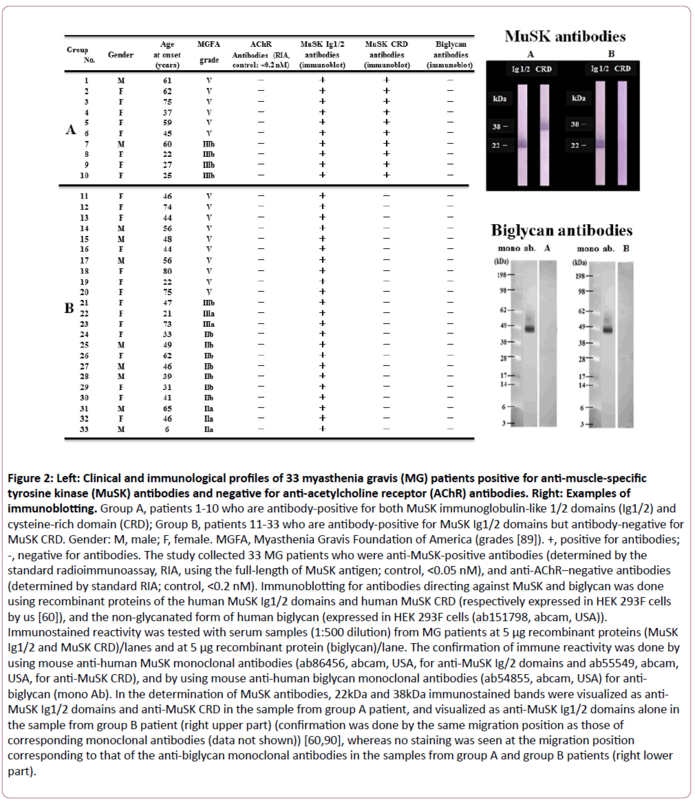 We therefore studied the serum samples from MuSK antibody-positive MG patients (33 patients positive for antibodies against Ig 1/2 domains, and 10 of them positive for anitbodies against both Ig 1/2 domains and CRD)  to determine whether they would contain the antibodies against biglycan, but we obtained negative results (Figure 2); the results were also negative in 10 healthy controls and 10 disease controls with AChR antibody-positive MG (data not shown). Figure 2: Left: Clinical and immunological profiles of 33 myasthenia gravis (MG) patients positive for anti-muscle-specific tyrosine kinase (MuSK) antibodies and negative for anti-acetylcholine receptor (AChR) antibodies. Right: Examples of immunoblotting. Group A, patients 1-10 who are antibody-positive for both MuSK immunoglobulin-like 1/2 domains (Ig1/2) and cysteine-rich domain (CRD); Group B, patients 11-33 who are antibody-positive for MuSK Ig1/2 domains but antibody-negative for MuSK CRD. Gender: M, male; F, female. MGFA, Myasthenia Gravis Foundation of America (grades ). +, positive for antibodies; -, negative for antibodies. The study collected 33 MG patients who were anti-MuSK-positive antibodies (determined by the standard radioimmunoassay, RIA, using the full-length of MuSK antigen; control, <0.05 nM), and anti-AChR–negative antibodies (determined by standard RIA; control, <0.2 nM). Immunoblotting for antibodies directing against MuSK and biglycan was done using recombinant proteins of the human MuSK Ig1/2 domains and human MuSK CRD (respectively expressed in HEK 293F cells by us ), and the non-glycanated form of human biglycan (expressed in HEK 293F cells (ab151798, abcam, USA)). Immunostained reactivity was tested with serum samples (1:500 dilution) from MG patients at 5 μg recombinant proteins (MuSK Ig1/2 and MuSK CRD)/lanes and at 5 μg recombinant protein (biglycan)/lane. The confirmation of immune reactivity was done by using mouse anti-human MuSK monoclonal antibodies (ab86456, abcam, USA, for anti-MuSK Ig/2 domains and ab55549, abcam, USA, for anti-MuSK CRD), and by using mouse anti-human biglycan monoclonal antibodies (ab54855, abcam, USA) for anti-biglycan (mono Ab). In the determination of MuSK antibodies, 22kDa and 38kDa immunostained bands were visualized as anti- MuSK Ig1/2 domains and anti-MuSK CRD in the sample from group A patient, and visualized as anti-MuSK Ig1/2 domains alone in the sample from group B patient (right upper part) (confirmation was done by the same migration position as those of corresponding monoclonal antibodies (data not shown)) [60,90], whereas no staining was seen at the migration position corresponding to that of the anti-biglycan monoclonal antibodies in the samples from group A and group B patients (right lower part). (1) Significant association with HLA-DR14-DQ5 (specific HLA alleles may vary with disease subtype and racial difference) [71,72]. (2) Reduction in B10 cells which block Th1 and Th17 immune reactions, suggesting the breakdown in immune tolerance [73-75]. (3) The disease-specific enrichment of circulating let-7 family microRNA . These immunological conditions may give us an information to understanding the pathophysiology of MuSK antibody-positive MG. However, it remains to be clarified if the immunological, genetic and environmental factors could reflect on the heterogeneity of MuSK antibodies in binding to MuSK functional domains which include the targets to participate in the linkage of MuSK with extracellular matrix (biglycan and collagen Q). Although biglycan is not directly targeted by autoantibodies in the NMJ as is suggested above, it is of note that biglycan stimulates multifunctional proinflammatory signaling linking the innate to adaptive immune systems when it is in a soluble form; this is based on that biglycan is capable of clustering several types of pathogen recognition receptors and orchestrating their signaling [77-79]. Reportedly, biglycan acts as a danger signal that activates the NLRP3 (NLR family, pyrin domain containing 3) inflammasome via Toll-like and purinergic P2X receptors [48,77-79]. In MG, biglycan produced in thymic myoid cells was shown to play a role in generation and maintenance of the hyperplastic change of MG thymus [80,81]. On the other hand, biglycan regulates the localization of the dystrophin/utrophin-associated protein complex at the sarcolemma and thereby counters dystrophic pathology in skeletal muscles [48,82-85]. Also, biglycan stimulates the bone formation process through the bone morphogenic protein/transforming growth factor-β signaling and the canonical Wnt/β-catenin-mediated-pathway [48,86]. The stability of rapsyn-anchored AChR clusters, MuSK and acetylcholinesterase (AChE) at the postsynaptic membrane is modulated by the extracellular matrix proteins (including biglycan, collagen Q, perlecan and α-dystroglycan) and by the laminin-network including laminins (α4, α5 and β2) which interacts with muscle agrin. The interaction of the extracellular matrix with transmembrane β-dystroglycan leads to the binding to rapsyn for anchoring AChR clusters at the endplate membrane and also the binding to dytrophyin/utrophin-associated protein complex linked to actin cytoskeleton for synaptic stability. Regarding biglycan, its glycosaminoglycan-binding form contributes to the synaptic stabilization via the interaction with dystroglycans; its non-glycanated form directly interacts with immunoglobulin-like domain 1 (Ig1) and cysteine-rich domain (CRD) of MuSK. The binding of collagen Q and biglycan with MuSK extracellular domains may lead to their implication in reinforcing a functional bridge between the agrin/Lrp4-signaling and the Wnt/Lrp4/Disahevelled (Dvl)-signaling. The cytoskeletal dynamics to stabilize the postsynaptic organization is also brought about by the Dok7-signaling mediator, CrkL-Sorbs1/2 (downstream effects of Crk/CrkL (adaptor proteins which act as CT10 regulators of kinase participating in AChR cluster formation; Dok7 itself acts as an inside-out ligand for MuSK)), and the α-dystrobrevin (mediator of the neuregulin 1 (NRG1)-ErbB (receptor tyrosine kinase of EGF family) interacting signal). Cortactin acts as a regulator of actin polymerization via actin-related proteins 2/3 complex (Arp2/3 complex) . Coronin 6 contributes to firm AChR clustering via the modulation of actin dynamics . In the right lower part, the two signalings are depicted: agrin/Lrp4-MuSK Ig1/2 domains and the Wnt/Lrp4-MuSK CRD-Dvl to form AChR clusters. ; the crosstalk between agrin- and Wnt-signalings (both including Lrp4) thereby contributes to the development of vertebrate NMJ. In the manner similar to Lrp4 and laminin β2, the Wnt-MuSK CRD-Dvl signaling acts as the retrograde signal (Wnt canonical pathway via β-catenin and also non-canonical pathway) which contributes to the active zone organization for conditioning the ACh-release probability in the nerve terminal. Group A, patients 1-10 who are antibody-positive for both MuSK immunoglobulin-like 1/2 domains (Ig1/2) and cysteine-rich domain (CRD); Group B, patients 11-33 who are antibody-positive for MuSK Ig1/2 domains but antibody-negative for MuSK CRD. Gender: M, male; F, female. MGFA, Myasthenia Gravis Foundation of America (grades ). +, positive for antibodies; -, negative for antibodies. The study collected 33 MG patients who were anti-MuSK-positive antibodies (determined by the standard radioimmunoassay, RIA, using the full-length of MuSK antigen; control, <0.05 nM), and anti-AChR–negative antibodies (determined by standard RIA; control, <0.2 nM). Immunoblotting for antibodies directing against MuSK and biglycan was done using recombinant proteins of the human MuSK Ig1/2 domains and human MuSK CRD (respectively expressed in HEK 293F cells by us ), and the non-glycanated form of human biglycan (expressed in HEK 293F cells (ab151798, abcam, USA)). Immunostained reactivity was tested with serum samples (1:500 dilution) from MG patients at 5 μg recombinant proteins (MuSK Ig1/2 and MuSK CRD)/lanes and at 5 μg recombinant protein (biglycan)/lane. The confirmation of immune reactivity was done by using mouse anti-human MuSK monoclonal antibodies (ab86456, abcam, USA, for anti-MuSK Ig/2 domains and ab55549, abcam, USA, for anti-MuSK CRD), and by using mouse anti-human biglycan monoclonal antibodies (ab54855, abcam, USA) for anti-biglycan (mono Ab). In the determination of MuSK antibodies, 22kDa and 38 kDa immunostained bands were visualized as anti-MuSK Ig1/2 domains and anti-MuSK CRD in the sample from group A patient, and visualized as anti-MuSK Ig1/2 domains alone in the sample from group B patient (right upper part) (confirmation was done by the same migration position as those of corresponding monoclonal antibodies (data not shown)) [60,90], whereas no staining was seen at the migration position corresponding to that of the anti-biglycan monoclonal antibodies in the samples from group A and group B patients (right lower part). Biglycan, an extracellular matrix protein, acts as a signaling molecule in the skeletal muscle through the linking to the MuSK extracellular domains (contributing to agrin- and Wnt-signalings to form rapsyn-anchored AChR clusters and trans-synaptic communication) and through the linking to the actin cytoskeleton (contributing to synaptic stabilization via dystroglycans). The localized sensitivity to ACh in the postsynaptic membrane is brought about by the stabilized AChE distribution based on the linkage of biglycan with AChE as well as the mechanism based on the collagen Q-AChE complex. These signaling cascades are potentially interrupted by the impairment of biglycan-MuSK linkage caused by anti-MuSK antibodies in MG, although our study showed that biglycan is not directly targeted by antibodies. Also, when biglycan is in a soluble form, it acts as an endogeneous ligand of innate immunity receptors to promote proinflammatory signal and also participates in hyperplastic change of MG thymus where biglycan is produced from myoid cells. On the other hand, skeletal muscle and bone pathologies are renovated by biglycan. We must see both faces of biglycan from the immunological and biological standpoints of view. Meriggioli MN, Sanders DB (2009) Autoimmune myasthenia gravis emerging clinical and biological heterogeneity. Lancet Neurol 8: 475-490. McConville J, Farrugia ME, Beeson D, Kishore U, Metcalfe R, et al. (2004) Detection and characterization of MuSK antibodies in seronegative myasthenia gravis. Ann Neurol 55: 580-584. Koneczny I, Cossins J, Waters P, Beeson D, Vincent A (2013) MuSK myasthenia gravis IgG4 disrupts the interaction of Lrp4 with MuSK but both IgG4 and IgG1-3 can disperse preformed agrin-independent AChR clusters. PLoS ONE 8: e80695. Huijbers MG, Zhang W, Klooster R, Niks EH, Friese MB, et al. (2013) MuSK IgG4 autoantibodies cause myasthenia gravis by inhibiting binding between MuSK and Lrp4. Proc Natl Acad Sci USA 110: 20783-20788. Verschuuren JJ, Huijbers G, Plomp JJ, Niks H, Molenaar PC, et al. (2013) Pathophysiology of myasthenia gravis with antibodies to the acetylcholine receptor, muscle-specific kinase and low-density lipoprotein receptor-related protein 4. Autoimmun Rev 2012: 918-923. Patel V, Oh A, Voit A, Sultatos G, Babu GJ, et al. (2014) Altered active zones, vesicle pools, nerve terminal conductivity, and morphology during experimental MuSK myasthenia gravis. PLoS ONE 9: e110571. Klooster R, Plomp JJ, Huijbers MG, Niks EH, Straasheijm KR, et al. (2012) Muscle-specific kinase myasthenia gravis IgG4 autoantibodies cause severe neuromuscular junction dysfunction in mice. Brain 135: 1081-1101. Mori S, Kubo S, Akiyoshi T, Yamada S, Miyazaki T, et al. (2012) Antibodies against muscle-specific kinase impair both presynaptic and postsynaptic functions in a murine model of myasthenia gravis. Am J Pathol 180: 798-810. Viegas S, Jacobson L, Waters P, Cossins J, Jacob S, et al. (2012) Passive and active immunization models of MuSK-ab positive myasthenia: Electrophysiological evidence for pre and postsynaptic defects. Exp Neurol 234: 506-512. Koneczny I, Stevens JA, de Rosa A, Huda S, Huijbers MG, et al. (2017) IgG4 autoantibodies against muscle-specific kinase undergo Fab-arm exchange in myasthenia gravis. J Autoimmun 77: 104-115. Higuchi O, Hamuro J, Motomura M, Yamanashi Y (2011) Autoantibodies to low-density lipoprotein receptor-related protein 4 in myasthenia gravis. Ann Neurol 69: 418-422. Pevzner A, Schoser B, Peters K, Cosma N-C, Karakatsani A, et al. (2011) Anti-LRP4 autoantibodies in AChR- and MuSK-antibody-negative myasthenia gravis. J Neurol 259: 427-435. Zhang B, Tzartos JS, Belimezi M, Ragheb S, Bealmear B, et al. (2012) Autoantibodies to lipoprotein-related protein 4 in patients with double-seronegative myasthenia gravis. Arch Neurol 69: 445-451. Shen C, Lu Y, Zhang B, Figueiredo D, Bean J, et al. (2013) Antibodies against low-density lipoprotein receptor-related protein 4 induce myasthenia gravis. J Clin Invest 123: 5190-5202. Zisimopoulou P, Evangelakou P, Tzartos J, Lazaridis K, Zouvelou V, et al. (2014) A comprehensive analysis of the epidemiology and clinical characteristics of anti-LRP4 in myasthenia gravis. J Autoimmun 52: 139-145. Zouvelou V, Zisimopoulou P, Rentzos M, Karandreas N, Evangelakou P, et al. (2013) Double seronegative myasthenia gravis with anti-LRP4 antibodies. Neuromuscul Disord 23: 568-570. Marino M, Scuderi F, Samengo D, Saltelli G, Maiuri MT, et al. (2015) Flow cytofluorimetric analysis of anti-LRP4 (LDL receptor-related protein 4) autoantibodies in Italian patients with myasthenia gravis. PLoS ONE 10: e0135378. Zhang B, Shen C, Bealmear B, Ragheb S, Xiong WC, et al. (2014) Autoantibodies to agrin in myasthenia gravis patients. PLoS ONE 9: e91816. Gasperi C, Melms A, Schoser B, Zhang Y, Meltoranta J, et al. (2014) Anti-agrin autoantibodies in myasthenia gravis. Neurology 82: 1976-1983. Südhof TC (2012) The presynaptic active zone. Neuron 75: 11-25. Jung JH, Szule JA, Marshall RM, McMahan UJ (2016) Variable priming of a docked synaptic vesicle. Proc Natl Acad Sci USA 113: E1098-E1107. Körber C, Kuner T (2016) Molecular machines regulating the release probability of synaptic vesicles at the active zone. Front Synaptic Neurosci 8: 5. Harris KP, Littleton JT (2015) Transmission, development, and plasticity of synapses. Genetics 201: 345-375. Wu H, Xiong WC, Mei L (2010) To bild a synapse: Signaling pathways in neuromuscular junction assembly. Development 137: 1017-1033. Zhang W, Coldefy AS, Hubbard SR, Burden SJ (2011) Agrin binds to the N-terminal region of Lrp4 protein and stimulates association between Lrp4 and the first Ig-like domain in muscle specific kinase (MuSK). J Biol Chem 286: 40624-40630. Zong Y, Zhang B, Gu S, Lee K, Zhou J, et al. (2012) Structural basis of agrin-Lrp4-MuSK signaling. Genes Dev 26: 247-258. Zong Y, Jin R (2013) Structural mechanisms of the agrin-Lrp4-MuSK signaling pathway in neuromuscular junction differentiation. Cell Mol Life Sci 70: 3077-3088. Weatherbee SD, Anderson KV, Niswander LA (2006) LDL-receptor-related protein 4 is critical for formation of the neuromuscular junction. Development 133: 4993-5000. Zang B, Luo S, Wang Q, Suzuki T, Xiong WC, et al. (2008) Lrp4 serves a coreceptor for agrin. Neuron 60: 285-297. Kim N, Stiegler AL, Cameron TO, Hallock PT, Gomez AM, et al. (2008) Lrp4 is a receptor for agrin and forms a complex with MuSK. Cell 135: 334-342. Zhang B, Liang C, Bates R, Yin Y, Xiong WC, et al. (2012) Wnt proteins regulate acetylcholine receptor clustering in muscle cells. Mol Brain 5: 7. Jing L, Lefebvre JL, Gordon R, Granato M (2009) Wnt signals organize synaptic prepattern and axon guidance through the zebrafish unplugged/MuSK receptor. Neuron 61: 721-733. Strochlic L, Falk J, Goillot S, Bourgeois F, Delers P, et al. (2012) Wnt4 participates in the formation of vertebrate neuromuscular junction. PLoS ONE 7: e29976. Koles K, Budnik V (2012) Wnt signaling in neuromuscular junction development. Cold Spring Harb Perspect Biol 4: a008045. Wu H, Lu Y, Barik A, Joseph A, Taketo MM, et al. (2012) β-catenin gain of function in muscles impairs neuromuscular junction formation. Development 139: 2392-2404. Wu H, Barik A, Lu Y, Shen C, Bowman A, et al. (2015) Slit2 as a β-catenin/Ctnnb1-dependent retrograde signal for presynaptic differentiation. eLife 4: e07266. Salinas PC (2005) Retrograde signaling at the synapse: A role for Wnt proteins. Biochem Soc Trans 33: 1295-1298. Messéant J, Dobbertin A, Girard E, Delers P, Manuel M, et al. (2015) MuSK Frizzled-like domain is critical for mammalian neuromuscular junction formation and maintenance. J Neurosci 35: 4926-4941. Messéant J, Ezan J, Delers P, Glebov K, Marchiol C, et al. (2017) Wnts proteins contribute to neuromuscular junction formation through distinct signaling pathways. Development 144: 1712-1724. Yumoto N, Kim N, Burden SJ (2012) Lrp4 is a retrograde signal for presynaptic differentiation at neuromuscular synapses. Nature 489: 438-442. Wu H, Lu Y, Shen C, Patel N, Gan L, et al. (2012) Distinct roles of muscle and motoneuron Lrp4 in neuromuscular junction formation. Neuron 75: 94-107. Constantin B (2014) Dystrophin complex functions as a scaffold for signaling proteins. Biochem Biophys Acta 1838: 635-642. Yurchenco PD (2011) Basement membranes: Cell scaffoldings and signaling platforms. Cold Spring Harb Perspect Biol 3: a004911. Singhal N, Martin PT (2011) Role of extracellular matrix proteins and their receptors in the development of the vertebrate neuromuscular junction. Dev Neurobiol 71: 982-1005. Pilgram GSK, Potikanond S, Baines RA, Fradkin LG, Noordemeer JN (2010) The roles of the dystrophin-associated glycoprotein complex at the synapse. Mol Neurobiol 41: 1-21. Karmouch J, Dobbertin A, Sigoillot S, Legay C (2013) Developmental consequences of the Col Q/MuSK interactions. Chem Biol Interact 203: 287-291. Amenta AR, Creely HE, Mercado ML, Hagiwara H, McKechnie BA, et al. (2012) Biglycan is an extracellular MuSK binding protein important for synapse stability. J Neursci 32: 2324-2334. Nastase MV, Young MF, Schaefer L (2012) Biglycan: A multivalent proteoglycan providing structure and signals. J Histochem Cytochem 60: 963-975. Schmidt N, Akaaboune M, Gajendran N, Martinez-Pena y Valenzuela I, Wakefield S, et al. (2011) Neuregulin/ErbB regulate neuromuscular junction development by phosphorylation of α-dystrobrevin. J Cell Biol 195: 1171-1184. Hallock PT, Xu CF, Park TJ, Neubert TA, Curran T, et al. (2010) Dok7 regulates neuromuscular synapse formation by recruiting Crk and Crk-L. Genes Dev 24: 2451-2461. Hallock PT, Chin S, Blais S, Neubert TA, Glass DJ (2015) Sorbs 1 and 2 interact with Crk-L and are required for acetylcholine receptor cluster formation. Mol Cell Biol 36: 262-270. Nishimune H (2012) Molecular mechanism of active zone organization at vertebrate neuromuscular junctions. Mol Neurobiol 45: 1-16. Samuel MA, Valdez G, Tapia JC, Lichtma JW, Sanes JR (2012) Agrin and synaptic laminin are required to maintain adult neuromuscular junctions. PLoS ONE 7: e4666. Bergamin E, Hallock PT, Burden SJ, Hubbard SR (2010) The cytoplasmic adaptoer-protein Dok7 activates the receptor tyrosine kinase MuSK via dimerization. Mol Cell 39: 100-109. Otsuka K, Ito M, Ohkawara B, Masuda B, Kawakami Y, et al. (2015) Collagen Q and anti-MuSK autoantibody competitively suppress agrin/LRP4/MuSK signaling. Sci Rep 5: 13928-13939. Kawakami Y, Ito H, Hirayama M, Sahashi K, Ohkawara B, et al. (2011) Anti-MuSK autoantibodies block binding of collagen Q to MuSK. Neurology 77: 1819-1826. Cossins J, Belaya K, Zoltowska K, Koneczny I, Maxwell S, et al. (2012) The search for new antigenic targets in myasthenia gravis. Ann NY Acad Sci 1275: 123-128. Zoltowska Katarzyna M, Belaya K, Leite M, Patrick W, Vincent A, et al. (2015) Collagen Q–a potential target for autoantibodies in myasthenia gravis. J Neurol Sci 348: 241-244. Barik A, Zhang B, Sohal GS, Xiong WC, Mei L (2014) Crosstalk between agrin and Wnt signaling in development of vertebrate neuromuscular junction. Dev Neurobiol 74: 828-838. Takamori M, Nakamura T, Motomura M (2013) Antibodies against Wnt receptor of muscle-specific tyrosine kinase in myasthenia gravis. J Neuroimmunol 254: 183-186. Huijbers MG, Vink Anna-Fleur D, Niks EH, Westhuis RH, van Zwet EW, et al. (2016) Longitudinal epitope mapping in MuSK myasthenia gravis: implications for disease severity. J Neuroimmunol 291: 82-88. Berrih-Aknin S, Le Panse R (2014) Myasthenia gravis: a comparative review of immune dysregulation and etiological mechanisms. J Autoimmun 52: 90-100. Bao S, Rajotte-Caron J, Hammoudi D, Lin J (2016) Implications of epigenetics in myasthenia gravis. J Autoimmune Disord 2: 22-30. Li HF, Hong Y, Zhang X, Xie Y, Skeie G, et al. (2016) Gene polymorphisms for both auto-antigen and immune-modulating proteins are associated with the susceptibility of autoimmune myasthenia gravis. Mol Neurobiol 54: 4771-4780. Hong Y, Skeie GO, Zisimopoulou P, Karagiorgou K, Tzartos SJ, et al. 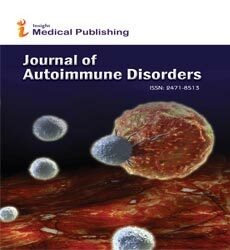 (2017) Juvenile-onset myasthenia gravis: autoantibody status, clinical characteristics and genetic polymorphisms. J Neurol 264: 955-962. Yue YX, Hong Y, Xie Y, Hao HJ, Sui Y, et al. (2016) Association study between IL-17A and IL-17F gene polymorphism and myasthenia gravis in Chinese patients. Neurol Sci 37: 123-130. Romi F, Hong Y, Gilhus NE (2017) Pathophysiology and immunological profile of myasthenia gravis and its subgroups. Curr Opin Immunol 49: 9-13. Renton AE, Pliner HA, Provenzano C, Evoli A, Ricciardi R, et al. (2015) A genome-wide association study of myasthenia gravis. JAMA Neurol 72: 396-404. Poulas K, Koutsouraki E, Kordas G, Kokla A, Tzartos SJ (2012) Anti-MuSK- and anti-AChR-positive myasthenia gravis induced by d-penicillamine. J Neuroimmunol 250: 94-98. Cufi P, Dragin N, Ruhlmann N, Weiss JM, Fadel E, et al. (2014) Central role of interferon-beta in thymic events leading to myasthenia gravis. J Autoimmun 52: 44-52. Kanai T, Uzawa A, Kawaguchi N, Sakamaki T, Yoshiyama Y, et al. (2016) HLA-DRB1*14 and DQB1*05 are associated with Japanese anti-MuSK antibody-positive myasthenia gravis patients. J Neurol Sci 363: 116-118. Niks EH, Kuks JB, Roep BO, Haasnotot GW, Verduijn W, et al. (2006) Strong association of MuSK antibody-positive myasthenia gravis and HLA-DR14-DQ5. Neurology 66: 1772-1774. Yilmaz V, Oflazer P, Aysal F, Durmus H, Poulas K, et al. (2015) Differential cytokine changes in patients with myasthenia gravis with antibodies against AChR and MuSK. PLoS ONE 10: e0123546. Guptill JT, Yi JS, Sanders DB, Guidon AC, Juel VC, et al. (2015) Characterization of B cells in muscle-specific kinase antibody myasthenia gravis. Neurol Neuroimmunol Neuroinflamm 26: e77. Yi JS, Guidon A, Sparks S, Osborne R, Juel VC, et al. (2014) Characterization of CD4 and CD8 T cell responses in MuSK myasthenia gravis. J Autoimmun 52: 130-138. Punga T, Bartoccioni E, Lewandowska M, Damato V, Evoli A, et al. (2016) Disease specific enrichment of circulating let-7 family microRNA in MuSK+ myasthenia gravis. J Neuroimmunol 292: 21-26. Bavelova A, Moreth K, Tsalastra-Greul W, Zeng-Brouwers J, Eickelberg O, et al. (2009) Biglycann, a danger signal that activates the NLRP3 inflammasome via Toll-like and P2X receptors. J Biol Chem 284: 24035-24048. Moreth K, Iozzo RV, Schaefer L (2012) Small leucine-rich proteoglycans orchestrate receptor crosstalk during inflammation. Cell Cycle 11: 2084-2901. Frey H, Schroeder N, Manon-Jensen T, Iozzo RV, Schaefer L (2013) Biological interplay between proteoglycans and their innate immune receptors in inflammation. FEBS J 280: 2165-2179. Tomoyasu H, Kikuchi A, Kamo I (1998) Identification of haemopoietic biglycan in hyperplastic thymus associated with myasthenia gravis. J Neuroimmunol 89: 59-63. Kikuchi A, Tomoyasu H, Kamo I (2008) IL-2 and proteoglycans synergistically induce antigen-specific B-cell responses–a possible immune response in the hyperplastic myasthenia thymus. J Neuroimmunol 205: 37-43. Amenta AR, Yimaz A, Bogdanovich S, McKechnie BA, Abedi M, et al. (2011) Biglycan recruits utrophin to the sarcolemma and counters dystrophic pathology in mdx. Proc Natl Acad Sci USA 108:762-767. Ito M, Ehara Y, Li S, Inada K, Ohno K (2016) Protein-anchoring therapy of biglycan for mdx mouse model of Duchenne muscular dystrophy. Hum Gene Ther 28: 428-436. Brandan E, Qutierrez J (2013) Role of skeletal muscle proteoglycans during myogenesis. Matrix Biol 32: 289-297. Bowe MA, Mendis DB, Fallon JR (2000) The small leucine-rich repeat proteoglycan biglycan binds to α-dystroglycan and is upregulated in dystrophic muscle. J Cell Biol 148: 801-810. Berendsen AD, Fisher LW, Kilts TM, Owens RT, Robey PG, et al. (2011) Modulation of canonical Wnt signaling by the extracellular matrix component biglycan. Proc Natl Acad Sci USA 108: 17022-17027. Madhavan R, Gong ZL, Ma JJ, Chan AWS, Pen HB (2009) The function of cortactin in the clustering of acetylcholine receptors at the vertebrate neuromuscular junction. PLoS ONE 4: e8478. Chen Y, Ip FCF, Shi L, Zhang Z, Tang H, et al. (2014) Coronin 6 regulates acetylcholine receptor clustering through modulating receptor anchorage to actin cytoskeleton. J Neurosci 34: 2413-2421. Jaretzk IIIA, Barohn RJ, Ernstoff RM, Kaminski HL, Keesey JC, et al. (2000) Myasthenia gravis: recommendations for clinical research standards. Task Force of the Medical Scientific Advisory Board of the Myasthenia Gravis Foundation of America. Neurology 55: 16-23. Takamori M (2017) Synaptic homeostasis and its immunological disturbance in neuromuscular junction disorders. Int J Mol Sci 18: 896-908.